Through in-depth interviews, Maister explores the crucial role of the individual manager in promoting high morale among employees.Practice What You Preachboasts specific action recommendations from the managers of these "superstar" businesses on how to build an energized workplace, enforce standards of excellence, develop people, and have fun -- all in the name of profit. 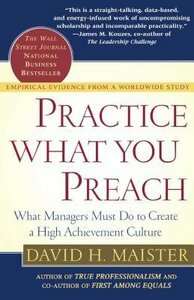 As a result,Practice What You Preachcan help any manager increase profitability, and provides proof that great financial rewards come from living up to the standards that most businesses advocate, but few achieve. About "Practice What You Preach"